AFP Consulting, LLC - Jock Tax Professionals | Great Scott! 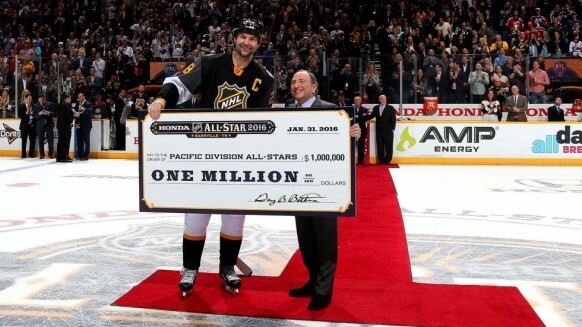 John Scott may have been an unwanted guest at the NHL All-Star Game this weekend, but he left with the game’s MVP award and a share of his team’s million-dollar bonus check – now the question remains who else will get a share of his winnings? This past weekend, NHL All-Stars competed in a three on three tournament with the Pacific division team splitting a one million-dollar bonus between the eleven players on the squad or $90,909 per player. As a bonus, based on performance this amount is considered income and will be subject to taxes at both the federal and at the state level. While federal tax is straight forward, the complex tax issues arise at the state level. With the NHL All-Star game being played in Tennessee, a state where there is no income tax, one might assume that this income would be exempt from all state tax. Unfortunately, this assumption is wrong. At the state level for non-residents – or as in the case of professional athletes in which it’s referred to as a ‘jock tax’ – income is taxed based on the allocation of total income as a percentage of days in each state in which games are played during the year. To better understand how the bonus will be allocated at the state level we’ll take a closer look at two of this weekends participants; Pacific team captain and All-Star game MVP, John Scott, and his teammate Joe Pavelski. Even though Scott is currently in the American Hockey League and in Canada, his winnings will be allocated in a similar manner as Pavelski’s. For both players, their entire winnings will be subject to resident tax in their home state or province. For Pavelski this is California and for Scott it would be Newfoundland. Additionally, their winnings will be subject to non-resident tax and allocated, based on duty days in each state they played in 2016. Therefore, Pavelski will need to allocate his bonus into each state that he and the Sharks play for the remainder of the spring which includes: Arizona, St. Louis, Missouri, Illinois, North Carolina, Colorado, and Minnesota. John Scott’s allocation is a little less straight forward because of his trade on January 15th, which saw him go from Arizona to St. John’s. Because he spent 15 days in Arizona, he will have to allocate a portion of the bonus to the state and pay tax on it. The rest of the total earnings will be allocated to Newfoundland and anywhere else he may play in 2016. If Scott remains with the St. John’s IceCaps for the remaining of the season, he will need to allocate the bonus into the following states: New York, Connecticut and Maine. Next season, the above allocation will change as both teams will have approximately 110 duty days starting from training camp to the end of the year. Assuming both players play next season they will have over 200 duty days in order to allocate their income. In addition to the jurisdictions listed above for Pavelski and Scott respectively, they will also have to allocate their winnings to any additional jurisdictions they play in from October to December. No matter where a performance bonus is earned, it will be allocated and subject to non-resident taxes in all states in which they perform services in during that year. For athletes, this is often referred to as a jock tax and every state in which they play in during the year will want their share of the athlete’s income which includes not only their wages but all performance bonuses as well.